In an iconic judgement, Supreme Court of India has imposed a ban on registration of any new SUVs and luxury sedans whose engine capacity is over 2000cc. The restriction is imposed for a period of 3 months, w.e.f January 1 till March 31 in Delhi. Yesterday, Supreme court hinted to people of Delhi that it might ban registration of diesel SUVs and Sedans for 3 months. Accordingly the court has ruled the judgement today. In the other hand, the court has also ruled that diesel commercial vehicles which were registered before 2005 is restricted to enter Delhi. Event the entry of commercial vehicles that are not Delhi bound has also been banned, with the court ordering the traffic police to draw up alternate routes – trucks usually take National Highway 1 and National Highway 8 that take them through the capital. The green tax which are charged for trucks that enter the city has also been doubled. Also all the taxis that are plying in the national capital have also been ordered to switch to CNG by March 31 2016. The Supreme Court’s decision came in response to a clutch of petitions including one on banning diesel vehicles in some cities in the face of alarming pollution levels in the country. 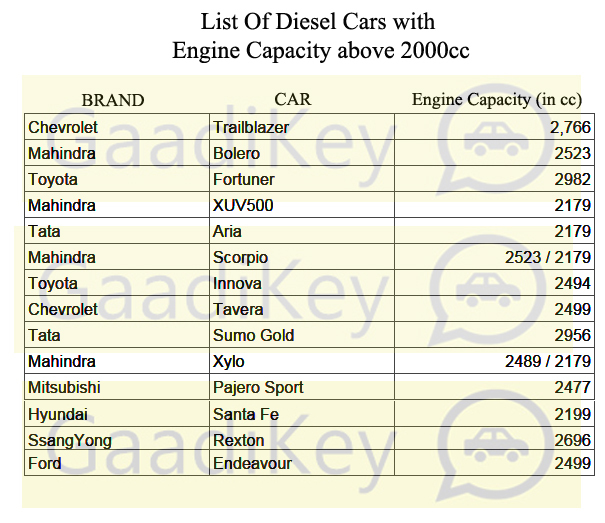 The list of diesel cars whose engine capacity is above 2000cc include: Chevrolet Trailblazer, Mahindra Bolero, Toyota Fortuner, Mahindra XUV500, Tata Aria, Mahindra Scorpio, Toyota Innova, Chevrolet Tavera, Tata Sumo Gold, Mahindra Xylo, Mitsubishi Pajero Sport, Hyundai Santa Fe, Ssan Yong Rexton, Maruti Grand Vitara, Ford Endeavour and others. Interestingly among the Indian cars, Tata Sumo has highest engine capacity of 2982cc.